After JAB Holdings' shopping spree, only Dunkin' Brands and Starbucks remain on the public markets. Here's who did better this year. If anything has stood out about the coffee industry in 2016, it's the series of acquisitions by privately held coffee giant JAB Holdings. The German company had already snatched up prominent American chains like Caribou Coffee and Peet's Coffee earlier in the decade, as well as brands like Stumptown Coffee and Einstein Bros.
After taking many publicly traded coffee stocks off the market, JAB's shopping spree leaves only two prominent coffee stocks left: Starbucks (NASDAQ:SBUX) and Dunkin' Brands (NASDAQ:DNKN). The chart below shows the stocks' performances thus far this year. However, those results may be a little deceiving. A longer view offers a different impression. 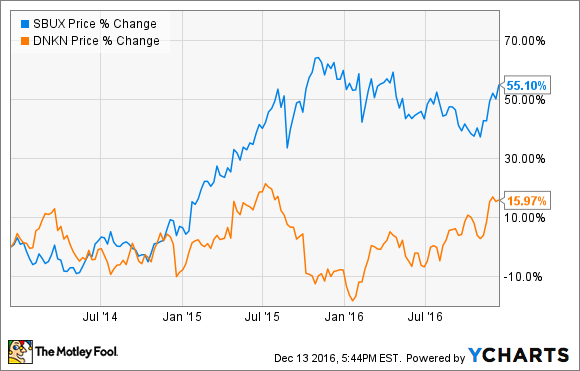 As you can see, Dunkin Donuts-parent Dunkin' Brands has been the clear winner in 2016, but its gains came following a sharp loss in the second half of 2015. Starbucks, on the other hand, surged last year, but the stock has taken a breather after gaining nearly 50% this year. Let's take a closer look at what's fueled each stock this year. After slumping alongside the market in January, Dunkin' shares got a boost in early February when it reported fourth quarter earnings from 2015. Dunkin' Brands, which also owns Baskin' Robbins, beat earnings estimates even as comparable sales growth was just 0.8% at Dunkin's U.S. stores. The company opened 172 net stores worldwide in the quarter as it continued to expand aggressively through franchising. Management also raised its quarterly dividend from $0.265 to $0.30, meaning the payout has now doubled since the company's IPO in 2012. Dunkin' stock jumped 6% on the report. The stock continued to climb through February as the market recovered, but gave back much of those gains through the spring. Dunkin's first-quarter and second-quarter reports were roughly in line with estimates, and the stock barely moved following them. Through the second half of the year, the stock continued to rise in spite of concerns about a restaurant recession as a number of its peers reported declining comparable sales. The company's biggest product-related news came at the end of September when it said would team up with Coca-Cola (NYSE: KO) to produce ready-to-drink beverages available in stores to rival Starbucks' own bottled beverages, such as its Frappuccino and DoubleShot. The stock gained 3% on the news, and got a further boost on the post-election rally, gaining more than 10% since Trump's victory. Starbucks shares moved similarly to Dunkin's during parts of the year as both stocks fell during the spring and have surged since the election. Like Dunkin', Starbucks' earnings results were essentially in line with estimates throughout the year, but slowing comparable sales growth seemed to worry investors, even though its results continue to be much better than its peers'. Starbucks' stock fell by more than 6% on February 5 as investors sold off high-multiple stocks as the market cratered. Since Starbucks is a premium brand, investors have a tendency to flee the stock in a market panic. Later in the month, Starbucks announced changes to its loyalty program so that customers are rewarded for dollars spent rather than number of transactions, a move that prompted a modest customer backlash. The stock dipped 5% after its second-quarter earnings report came out in April and showed slowing comparable sales growth, and it continued to slide in May. After trading sideways for the next several months, shares hit a 52-week low after the fourth-quarter earnings in November, but that quickly turned into a modest relief rally, continuing after the election. Shares sold off after Howard Schultz said he would step down as CEO, but they recovered as Starbucks revealed its plans for the future at its biennial Investor Day conference last week. Who's the better pick in 2017? While Dunkin's stock has outperformed Starbucks in 2016, Starbucks' financial performance has been better as both comparable sales and earnings per share growth outpaced Dunkin's results. 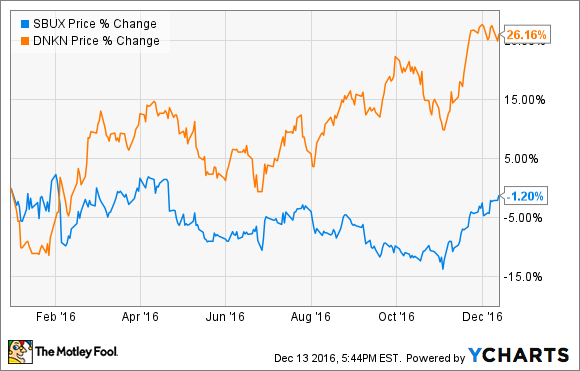 As a result of Dunkin's gains this year, its stock now trades at a higher P/E valuation than Starbucks', at 38 vs. Starbucks' 31. Investor expectations can be finicky, and a wide range of factors can influence a stock's performance. However, given Starbucks' better momentum and its lower valuation, it looks like it's set up to outperform Dunkin' Brands next year.